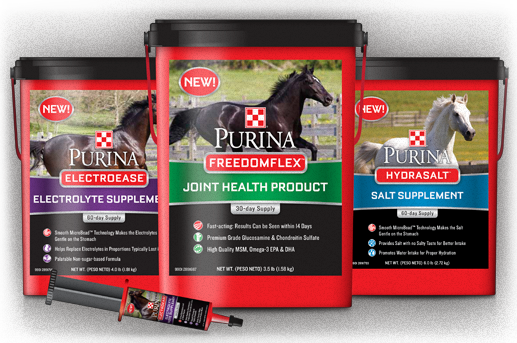 Receive up to $20 OFF Purina’s New Equine Supplements here. Daily exercise and the rigors of competition are some of the most common causes of joint injuries in horses, injuries which can lead to a considerable amount of lost training time. supplement for joints is an ideal solution for protecting against joint damage and helping the horse’s body to repair ongoing damage. Wear and tear on the skeletal system of a performance horse, particularly the cartilage surfaces of joints, may be an inevitable consequence of exercise or simply getting older. Degenerative joint disease (DJD) sometimes referred to as osteoarthritis (OA), is believed to increase with age and is often seen in active performance horses. damaging effects of friction. If the fluid is absent, the joint will begin to grind itself away, in the same way a car engine without oil will quickly seize up. to minimize the amount of impact on the joint, while achieving optimum cardiovascular, respiratory, muscular, skeletal and psychological fitness for the task at hand. Providing a health and support supplement for joints is often one of the best remedies for OA. 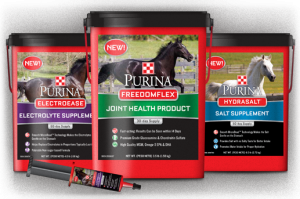 Recently, Purina Animal Nutrition partnered with U.K.-based Science Supplements to launch a line of horse supplements that includes FreedomFlex™ Joint Health Product, which contains high quality ingredients tested against the stringent research standards that both Purina and Science Supplements are known for. This means that Purina Animal Nutrition products are proven to work before being released. the effectiveness of joint supplements. Key ingredients at ideal levels help stimulate the synthesis of collagen, necessary for joint support. of premium-grade active ingredients, results can be seen as soon as 14 days. Contact Lochte Feed & General Store for any questions regarding the new equine supplements! This entry was posted on Friday, February 15th, 2013 at 3:01 pm	and is filed under News & Updates. You can follow any responses to this entry through the RSS 2.0 feed. Both comments and pings are currently closed.